A pairing of super sweet ketchup and smoky and meaty bacon output a sauce that suffers from a bit of a personality disorder. You're probably familiar with King's Hawaiian as a bread company, and the history of those sweet rolls started in the 1950's in Hilo, Hawaii by Robert Taira. The sweet bread Robert was producing in his bakery there became so popular, he moved to Honolulu in 1963 and renamed the shop to King's Bakery for the street it was located on. In 1977, Robert brought his baking talents to the mainland with a store dubbed King's Hawaiian Bakery in Torrance, CA. The bakery gained a loyal and growing following in California, which lead Robert to create more bread options that remain synonymous with the brand today—Sweet Dinner Rolls and Honey Wheat Bread. In the 1990's, King's Hawaiian's popularity only continued to grow, which resulted in a large expansion of the bakery, and in 2002 the Taira family opened a sit down restaurant called The Local Place Bakery & Café not far from the bakery in Torrance. You can find King's Hawaiian bread in grocery stores across the country, and I've lately noticed a line of their barbecue sauces adorning shelves as well, so picked up this one to try out. There's no mistaking the bacon in the sauce with an aroma that's heavily smoky and meaty. Mixing in with the smoked pork smell is a strong and very sweet ketchup profile that hints at a hearty helping of additional sugar. As for the secondary players, there's definite notes of garlic, onion, and black pepper, as well as a mellow Worcestershire aroma that give the smoky and sweet sauce extra complexity. This rusty red sauce has a glossy sheen and a very textured consistancy thanks to what looks like large bits of bacon and onion. It's mostly opaque, but you can see lots of spices, mostly larger bits of black pepper, but also some smaller white and red spice specs too. The sauce has a medium thickness and it falls from a suspended spoon in quick, uneven pour that changes to slow drips. After three or four final drips release, a medium coating of sauce is left clinging to the silverware. 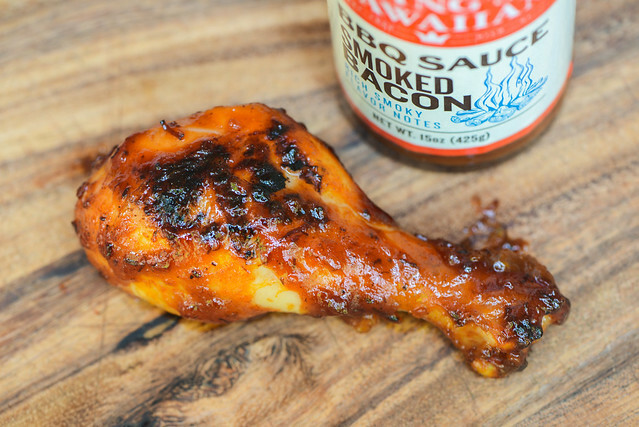 The first taste of this sauce is all sugar, but a strong meaty and smoky bacon component enters quickly to provide a defining flavor. Next, the sugar gains a tomato flavor, creating a ketchup-like taste that feels like an odd pairing with the bacon. 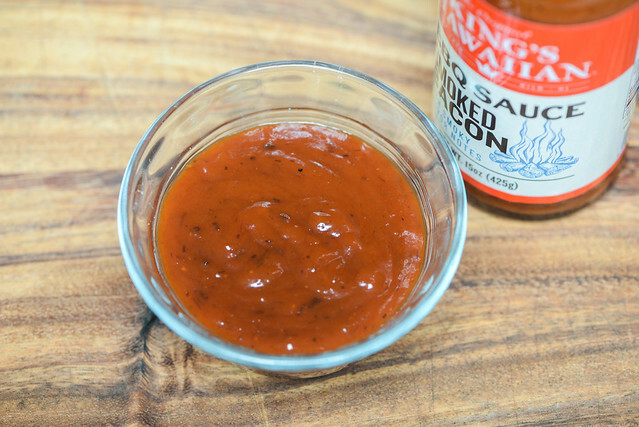 As the sauce settles on the tongue, a strong onion flavor works its way in, along with Worcestershire sauce, which all combine to give the sauce a real barbecue profile. Underlaying all of this is a mellow tang that gets overtaken in the end with a ramp up in both the sugar and bacon. Those two dominant traits meld with a mild pepper to form into a smoky, meaty, sweet, and lightly sharp aftertaste. The sauce coated the chicken in a medium, uneven layer that baked down well over indirect heat. When moved directly over the coals, there was quick caramelization, but without burning and only minimal sauce loss. The flavor really converted to just sweet ketchup and bacon after being cooked. A lot of the nuances from out the jar became lost, and left only the somewhat weird interplay between ketchup and bacon on its own. I'll start by saying that I can never have enough King's Hawaiian bread, but for this Smoked Bacon BBQ Sauce—one try was enough for me. Beyond the very processed taste and feel, the dichotomy between ketchup and bacon left me scratching my head a bit on what this sauce was trying to accomplish. I've experienced much better ways to get both meaty and smoky components into sauces, and I felt this one took the bacon a little too far for its own good. I wasn't so into the way it worked on the chicken, and really couldn't think of many uses for the sauce, expect for maybe as a condiment for burgers. 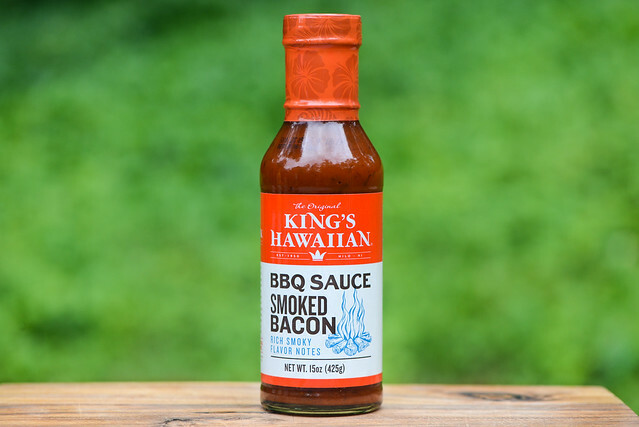 While this sauce didn't hit home for me, I'm still such a fan of the King's Hawaiian brand and I'm looking forward to seeing if any of their other barbecue sauces do the job any better.